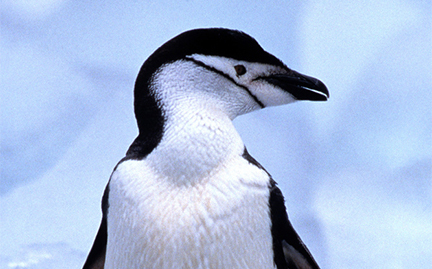 The chinstrap penguin’s name comes from a thin band of black feathers just below the chin, extending from ear to ear. Over 100,000 pairs gather at some colonies. Breeding pairs share a close bond, and most individuals return every year to the same nest site with the same partner. In the fall, they leave the breeding colonies, heading for open waters where large groups congregate over winter until the following spring, when they make their way back to land.